Fifth Ward Map. Image available on the Internet and included in accordance with Title 17 U.S.C. Section 107. Mt. Vernon United Methodist Church. Image available on the Internet and included in accordance with Title 17 U.S.C. Section 107. FIFTH WARD, HOUSTON. The Fifth Ward, a musically rich neighborhood located east of downtown Houston, is bounded by Buffalo Bayou on the south, Lockwood Drive on the east, Liberty Road on the north, and Jensen Drive on the west. The site was sparsely inhabited before the Civil War. It was subsequently settled by freedmen and became known as the Fifth Ward in 1866, when an alderman was elected to represent the community in the Houston city government. At the time half the population was black and half white. By 1870 the population of the ward comprised 561 white and 578 black residents. Two schools, one black and one white, corresponded to the roughly equal segments of the ward's population in 1876. Mount Vernon United Methodist Church, founded in 1865 by former slave Rev. Toby Gregg, is the oldest institution in the ward. Five other churches are over 100 years old: Pleasant Grove Baptist, Mount Pleasant Baptist, Sloan Memorial United Methodist, Payne Chapel Methodist, and First Shiloh Baptist. The Fifth Ward was also the site of a saloon named for Carry Nation, which, after considerable damage resulting from a dispute with the owner over the name, was subsequently known as the "Carnation." In the 1880s the ward enjoyed a boom following the construction of repair shops for the newly-built Southern Pacific Railroad. Growth was interrupted by a fire in 1891 at the Phoenix Lumber Mill and another in 1912 that burned 119 houses, 116 boxcars, nine oil tanks, thirteen plants, and St. Patrick's Catholic Church and school. Fifth Ward Demography, 2000-2013 data. Image available on the Internet and included in accordance with Title 17 U.S.C. Section 107. Eventually, the Fifth Ward population became predominantly black. At Frenchtown, a four-square-block neighborhood in the ward, 500 blacks of French and Spanish descent from Louisiana organized a community in 1922. Black-owned businesses, including a pharmacy, a dentist's office, an undertaking parlor, a theater, and several barbershops, operated after 1900 on Lyons Avenue and numbered forty by 1925. Working-class blacks were primarily employed within walking distance of the ward; many worked for the Southern Pacific Railroad or at the Houston Ship Channel. Others commuted across town to work as domestics and servants for wealthy Houstonians. By 1927 Phillis Wheatley High School in the ward, with 2,600 students and sixty teachers, was one of the largest black high schools in America. Other new businesses developed in the 1930s, including printing plants, photography studios, and the Club Matinee, which came to be known as the Cotton Club of the South. Local businessman Grand Duke Crawford organized the Fifth Ward Civic Club. Mural dedicated to Peacock Records. Image available on the Internet and included in accordance with Title 17 U.S.C. Section 107. Houston's second housing project for African Americans, the Kelly Court Housing Project, opened after World War II. Early community activists included Lonnie Smith and Lilly Portley. Peacock Records, a recording company founded by music entrepreneur Don Robey and named after his popular Bronze Peacock Club, started in the ward, as did C. F. Smith Electric Company, one of the state's early licensed electrical-contracting companies. Finnigan Park, the second public park for blacks in Houston, opened in the community in the postwar years, and the Julia C. Hester House, a black community center, began service. Nat Q. Henderson, long-time principal of Bruce Elementary School, was the mayor of the Fifth Ward and became known for his leadership. With passage of integration laws in the 1960s, many residents left the community and sought wider opportunities. Throughout the 1970s and 1980s the Fifth Ward fell into decline, with rundown abandoned buildings, and developed a notorious reputation as a crime-ridden area. Texas Monthly described it as "Texas' toughest, proudest, baddest ghetto." Fifth Ward Community Redevelopment Corporation Logo. Image available on the Internet and included in accordance with Title 17 U.S.C. Section 107. Fifth Ward Mural. Image available on the Internet and included in accordance with Title 17 U.S.C. Section 107. In the 1990s and 2000s the area saw significant housing and commercial growth as the Fifth Ward Community Redevelopment Corporation, organized in 1989, worked to revitalize the neighborhood through new home construction as well as an increased focus on job training, access to technology, and access to the arts. A cultural arts festival celebrated the artistic, culinary, and musical heritage of the area. By 2008 the neighborhood had an estimated population of more than 22,000, and by 2015 revitalization efforts had included the construction of more than 300 new homes, two multifamily complexes, two new commercial developments, and two commercial renovations, as well as the installation of public art and monuments. Restoration had begun on the DeLuxe Theater, and the Fifth Ward was the site of community fairs, neighborhood cleanups, and educational programs for homebuyers. The Fifth Ward is noted for training many prominent athletes. Wheatley High School's prominent graduates included Barbara Jordan and Mickey Leland, members of Congress. Musicians from the ward include Arnett Cobb, Milton Larkin, and Illinois Jacquet. The pioneering and controversial rap group Geto Boys, which gained success in the 1990s, hailed from the Fifth Ward. The neighborhood is also the original home to the popular jazz fusion group Joe Sample and the Crusaders. Fifth Ward Redevelopment Corp. (http://www.fifthwardcrc.org), accessed October 5, 2015. Marie Phelps McAshan, A Houston Legacy: On the Corner of Main and Texas (Houston: Gulf, 1985). David G. McComb, Houston: The Bayou City (Austin: University of Texas Press, 1969; rev. ed., Houston: A History, 1981). WPA Writers Program, Houston (Houston: Anson Jones, 1942). 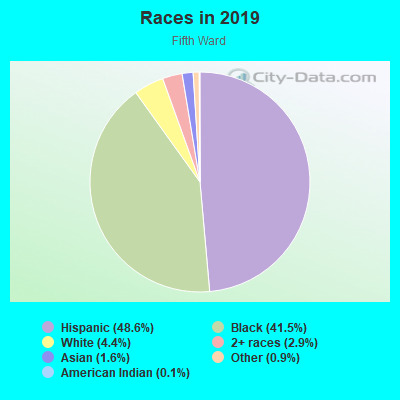 Handbook of Texas Online, Diana J. Kleiner, "FIFTH WARD, HOUSTON," accessed April 19, 2019, http://www.tshaonline.org/handbook/online/articles/hpfhk. Uploaded on June 12, 2010. Modified on February 13, 2017. Published by the Texas State Historical Association.